This is what you get when someone says, “Hey, you know what would be great? A samurai drama, but told as a high school harem comedy!” Gag me with a spoon! While the premise of this anime struck me as a bit absurd from the get-go, I was still hoping for a bit more than we got. Also, it’s easy to see where they got the “armed girls” bit, but what the heck was “Machiavellism” doing anywhere in the title? I have no idea. 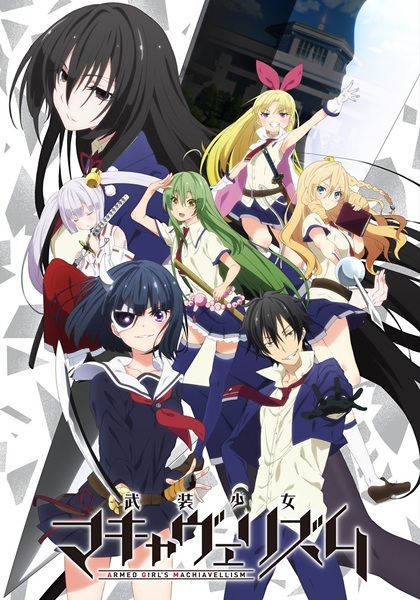 Armed Girl’s Machiavellism follows a young man, Nomura, as he enters a most unusual and unhealthy school, and directly challenges the status quo. Here, the girls aren’t just in charge, they dominate. They force every boy in the school to dress and wear makeup like a girl or face the withering and quite potentially lethal punishment of the school’s administrators, the Five Swords. Called such, creatively enough, because they wield swords. Real swords. In school. On a normal, regular, everyday basis. So, every time Nomura collides with one of the girls, he is facing death itself via sword strike. And this is considered “normal” here. Small wonder why the guys at the school all submitted, rather than be sliced and diced. However, Nomura is not the average high school delinquent. He, too, is trained in martial arts, indeed, in swordplay as well! But, twist, he is a swordless swordsman, using his glove hands to match the various swords and sword styles he encounters! And he is so strong and noble that every girl he fights falls for him in some way! Soooo exciting! I’m not sure if this was really meant to be serious, or if they deliberately made it so bad as a parody of all the harem high school comedies. Taking it at face value, though, it was difficult to take the over-the-top (melo)drama seriously even at the beginning, and it only got worse. Both the “humor” and the “drama” wore thin long before the season’s conclusion. And it was so formulaic! We have the strong girl who has one insane quirk relating to her emotional vulnerability, we have the high-class refined girl, we have the short girl, we have the crazy girl, we have the youngest girl who is actually the strongest of them all, and we have the overwhelmingly psychotic girl who is the most deadly and dangerous of them all and is “so in love” with the male lead that she wants to kill him and everyone around him, and Nomura challenges and befriends each of them in turn. Really, it was so ridiculous! Of course, you may be asking why I even bothered watching the anime if I disliked it so much. Well, as ridiculous as the beginning was, I was still a little curious and wondering if the murderous premise could be justified. Sadly, it wasn’t. Basically, and there’s not much to say beyond the basics, the idea could have turned out very differently. They could have had something genuinely funny, something that touched on the fighting spirit of warriors, something that had gripping emotional drama and meaningful relationships. Instead, we got a mess of everything that fell far short, becoming dull and drab by the end. Rating: 4 stars out of 10. Just barely on the wrong side of neutrality. This entry was posted in Anime and Cartoons, Tuesday Review and tagged Armed Girl's Machiavellism. Bookmark the permalink.